It's an impressive collection - 108 songs spanning 5 CDs. 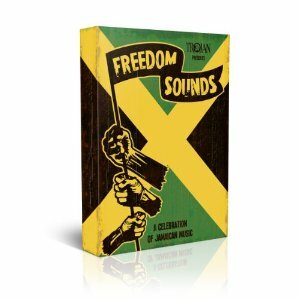 It features some big well known names that are familiar to music lovers around the world, including Bob Marley & The Wailers, Jimmy Cliff, Dennis Brown, Desmond Dekker, Toots & The Maytals and Gregory Isaacs as well as a whole host of other artists and producers who over the years have shaped the sound of Jamaican music. Around half the tracks are new to CD and there are many tracks here which are being released outside Jamaica for the first time, including ‘Fa Fa Fa Fa’ (Toots & The Maytals), ‘Brothers‘ (The Heptones), ‘It’s In The Plan’ (the Planners), ‘People Get Ready‘ (The Carib Beats), ‘A Taste Of Reggae‘ (Ska Campbell), plus a previously unissued version of the Pioneer’s hit single, ‘Let Your Yeah Be Yeah‘. As if there wasnt enough music here, fans purchasing the box set will also receive an additional free download album, when they register on the Trojan Appreciation Society website. The box set includes a 52 age booklet with a history of Jamaica and its music, as well as some A5 cards and a sticker. This is an impressive collection and one that has taken me a long time to review, simply because of the sheer volume of material here. It has a total running time of well over six hours, and some of the songs are so good that it would be a shame to just listen to them once. As a result I've probably spent close to 10 or 12 hours listening to the album. It's hard to pick out individual tracks when there are so many, so instead I'll just say this - if you're a fan of artists such as Bob Marley, Jimy Cliff, Desmond Dekker or any of the other bands featured here then I'd definitely recommend that you buy this box set. There are lots of tracks from artists you may not know, but when you listen to them then like me you're sure to find a whole load of songs that you love, and end up with a long list of bands you'd like to hear more from. This is a very impressive box set, packed full of great music - highly recommended.